All started with a zone (sphere) with an unbreakable dynamic membrane. On the left is shown how a HOLON is created. It is fact very simple. Two parts join in a new unity. But that Unity is a UNION. In the image on the left you see how the yellow active (male) tube penetrates the blue passive (female) tube. The result is a new zone B(a). That zone is called a HOLON. That holon has "structure" and is a "3D-Space". Till we introduced this holon engineering concept the holons were a type of abstraction which explained a hierarchic interconnectivity. Interconnectivity is an important aspect in all religions. General Jan Smuts described an abstract holistic connectivity. In 1967 Arthur Koestler described the Holon - still an abstraction - as a "self-assertiveness tendency" (wholeness) as well as an "integrative tendency"(part). We proposed an engineering picture, an infolding gravity mechanism, to explain a holon, and a concept that proves the complete interconnectivity in our Universe, and thus also between humans and all aspects of nature. The dynamic membrane background can be understood as a Riemann Space. Mathematically the concept can also be understood by the adapted Pascal Triangle, where in addition to the traditional version we added zero's and signs of infinity. Each "1" (a holon) comes from combinations of zero's. The neutral energy of the background can be called Zero Field Energy (ZPE). 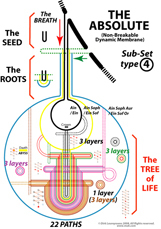 The holon concept can explain topologically the essence of Kabbalah (also called Cabale or Quabbalah). The Kabbalistic ABSOLUTE (or Hinduist Brahman) can create by penetrations of itself a three-layered holon. That gives the three Ain Voids, namely Ain, Ain Soph and Ain Soph Aur. The dynamic interactions between those three - still powered by the Absolute (Parabrahman) and still being Membrane - will caused from and/or between these layers a progressieve chain of more complex sub-holons by pelastration (penetration) actions. Click here to access the new webpage. 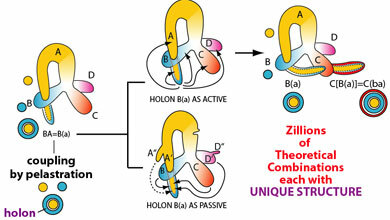 In the holon concept "ALL" starts with a 2D-zone (sphere) with a non-breakable membrane. From experience and observation we know that our universe is a moving, highly dynamic system. This Prior-geometry has no shape, only oscillating boundary. You can say that it is chaotic and fuzzy. This Prior-Geometry is NOT a Holon, because it doesn't contain structure, nor history, not time. It is the potency of Everything. It is genderless. In the top image we explained how the yellow active (male) tube penetrates the blue passive (female) tube. The result is a new zone B(a). So FROM a GENDERLESS system new ENTITIES WITH EMBEDDED DUAL ASPECTS are created. Starting from an unbreakable and almost infinite stretchable membrane several zones are created. These peaks can penetrate each other in zillions of ways. Since the membrane is unbreakable a new multi-layered zone is formed on every pelastration. A holon contains always the values/structure of the previous zones which created him. 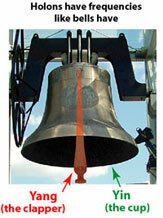 Holons can interact and combine to more complex holons. Under influence of internal oscillations between the layers new inside sub-holons can be made. This can also happen due external outside holons. 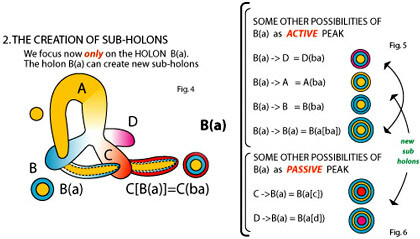 The below image shows the holon B(a) can create five different types of new holons in which B(a) is the active holon. Very important is that we see something unexpected: The number of layers may differ! (cf. numbers). Another very important aspect is shown: Holons have a UNIQUE layering HISTORY! This shows us that the universe is essential a non-commutative system. That means that mathematical theories about nature and cosmos which use commutative tricks are meaningless. The flipping over or inverting dimensions are not possible in an Unification Theory. 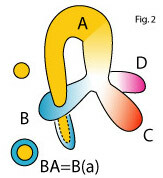 Figure 7 shows a more complex combination of C(ba) pelastrating B(a), but the inverse B(a) pelastrating C(ba) will give a different layering. The attentive reader will say that the latter is impossible since B(a) is already embedded in the middle of C(ba) ... which is correct ...but ... the tube A may create a second tube on it's surface and that can pelastrate B on another location! We can say that unique pelastration combinations in cosmology can be expressed by the Catalan numbers. 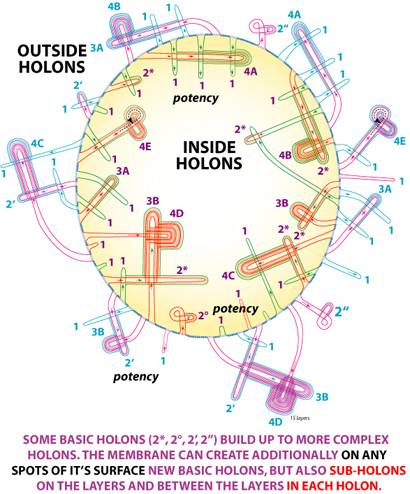 These principles of building up of holons gives us after only 5 steps next 22 unique holon types. Each of these holon type has a unique layering, so they vibrate each in an unique way. 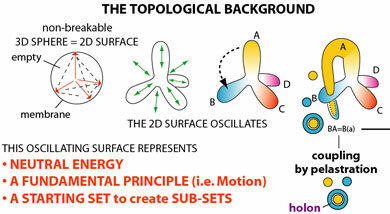 This image is based on the basic holon 2* on the inside of the membrane sphere. That gives 22 possible different holons. There is also a self-pelastrating basic holon 2° on the inside but this is not represented on the image. 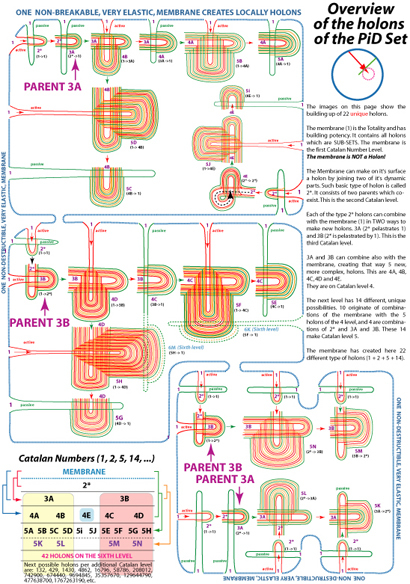 That 2° holon type gives also 22 possible different holons. Then there are two other basic holons (2' and 2") at the outside of the membrane sphere. They also can create each 22 different holon types. We can say that some of these 88 basic holons make the fundamental particles. The more layers they have the more mass they will have, and less flexibility they will have. Next image shows on the inside and the outside the first 8 different holons the basic holon 2* can make after 4 building steps + the basic holon 2°. This all is in full respect of logic and causality, so we don't need the Heidenberg Uncertainty Principle (HUP), Quantum Mechanics or magic super-positions to explain the Universal building up of Complexity. So holons prove us the interconnectivity of everything with everything ... a full holistic approach. Again: Although all holon building blocks are empty ... HOUSES are made. © Dirk Laureyssens, 2002/2008. All rights reserved.